The Commercial Flag is In-Stock Now! Each Feather Banner is an Eye-Popping 14' Tall. This Commercial Flag is Single Side Dyed Through, with the Reverse Image on the Other Side. 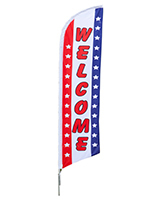 The commercial flag is made from polyester material. 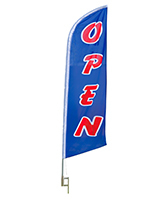 The sign is an inexpensive way to gain your customer's attention. 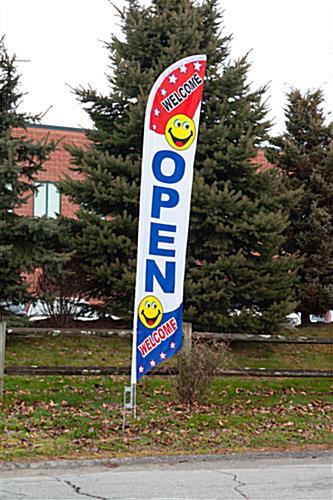 This commercial flag's message reads 'WELCOME OPEN WELCOME' to give customers a friendly greeting as they approach a business. Each feather flag comes in a red, blue and white color scheme and has two pictograms of yellow smiley faces. The commercial flag's graphics are imprinted on the material via dye sublimation. This allows the mirror image to be seen through on the other side. Each commercial flag that is affordable allows businesses to save money so they can advertise with a variety of POP displays. 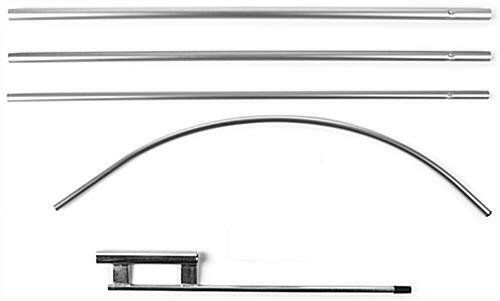 This display is most effective when used in conjunction with other advertising equipment in a comprehensive point-of-sale advertising campaign. 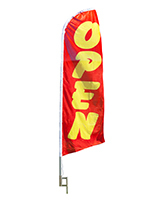 Each commercial flag is great for retail stores! 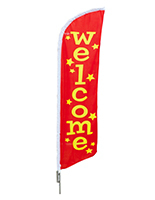 The feather banners aluminum pole is lightweight, making it easy to transport. 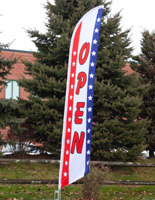 Each commercial flag that is inexpensive might not be as durable as a unit with a fiberglass pole, but it is a fraction of the cost. Advertisers can position the flag next to busy roads and sidewalks with the ground spike, provided a soft area such as grass is available. 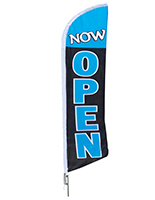 The commercial flag that comes with a ground stake can be used at different events and locations, as the steel spike is very durable. 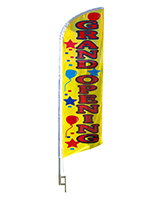 Each feather banner spike can be driven into soft surfaces up to 2' deep keeping the display stable even in light to moderate winds. The commercial flag stands 14' tall. 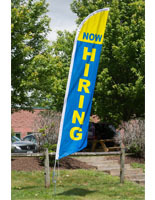 This feather banner's sheer height alone makes this graphic an attention grabber and will help to bring more customer s into the store, especially compared to traditional sidewalk signs.